Would you like to learn how to use social media marketing to expand your law practice online? We would like to invite you to join a small group of lawyers that are ready to use social media to take their practice to the next level. Join members and colleagues in the legal community on Thursday, February 27, 2014, at 6:00 p.m. at the Bar Center to develop an important tool to build your practice. As you may know, the marketing world is rapidly changing, and so are the methods being used to promote law practices online. Though traditional offline marketing is still dominant, new online media channels such as Twitter, Google+, and LinkedIn allow lawyers to create new business opportunities online. The social media marketing workshop will provide educational information on how to take advantage of social media concepts to promote your law practice online. How to create benchmarks to measure your success. 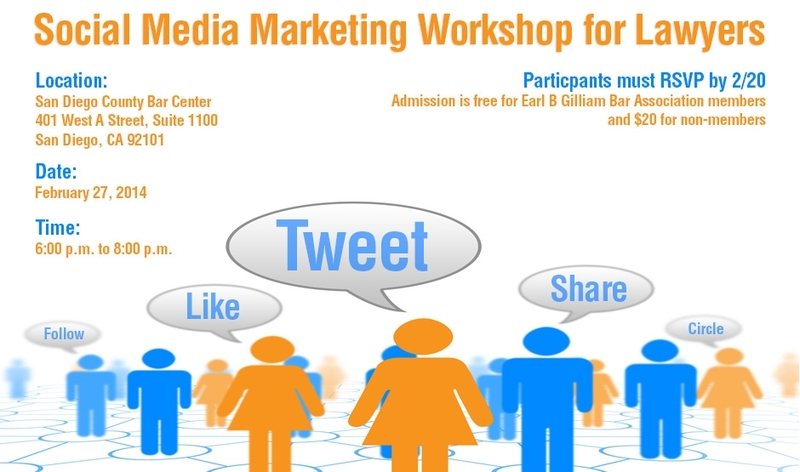 This workshop is recommended for lawyers that have a basic of understanding of social media marketing. Kymeshia Morris, Esq. is the founder of San Diego Esquire, a copywriting and social media marketing agency specializing in helping lawyers build effective and differentiated online marketing strategies and campaigns. Kymeshia earned her J.D. from Thomas Jefferson School of Law and her B.A. from San Diego State University.